Our friends at BikeSideLA are asking a simple question: “Is LA bike friendly?“. Take their three question survey and let us all know what you think of LA. The Mayor of Los Angeles gets to spend a nice chunk of change every year on his “Budget Day” survey. His staff of professional political consultants make a sloppy amateur’s attempt to survey residents for their input on “The Budget ™”. The whole thing feels more like an email harvesting scam for election year contact lists. Meanwhile, the questions that people in LA are really concerned with go unasked. Like all dysfunctional governments, LA’s people have had to develop their own shadow governments – Neighborhood Councils, unofficial Mayors of this block or that block, and a host of non-profit groups that do the real legwork without the guaranteed salary and benefits package our professional civil servants receive. When it comes to bikes, the Downtown-based LA County Bike Coalition has stepped up with a “bike count” – a first in LA. 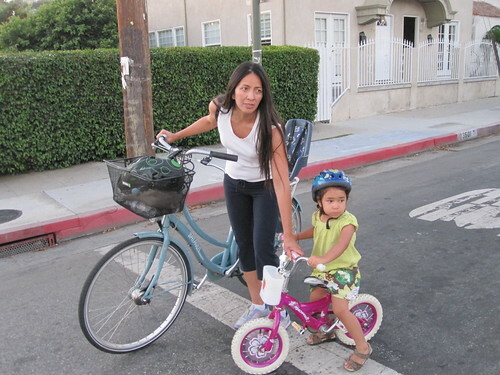 Over on the Westside of LA, BikeSide is asking a simple question: “Is LA bike friendly?“. It only takes a minute and they don’t want your contact information for their next mayoral campaign.